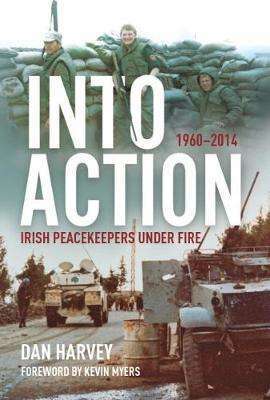 Into Action is the story of the Irish Defence Forces' role as international peacekeepers since 1960. While primarily posted to uphold the transition towards peace in overseas conflicts, they have at times inevitably been forced to fight back against often aggressive opposition. Dan Harvey's fascinating and accessible history follows the major military incidents in the peacekeepers' sixty-year campaign, from Niemba, the Siege at Jadotville, and Elizabethville in the Congo to At-Tiri in Lebanon, and Durbol in Syria. These are to name just a few of the military engagements that involved supreme bravery on behalf of the Irish Defence Forces and, at times, ended in terrible tragedy. Dan Harvey's detailed account of the military operations they were involved in reveal the defence forces' effective responses to crisis and conflict; how they stood firm during ethnically-motivated rioting in Gracancia or intervened in the midst of a clash between Chadian government forces and rebel attackers, and how the Irish nation was halted into mourning in November 1960 by news that nine soldiers of the 33rd Irish Battalion had been killed by Baluba warriors near Niemba in the Congo. These are the deeds and tragedies that have come to define Ireland’s role in international peacekeeping. Into Action reveals the true story of this role and the immense courage that have underlined its operations from the beginning.